Createspace Independent Publishing Platform, 9781534989320, 272pp. Dr. Jane O'Neil, an American psychiatry professor, books her family on a rafting trip down the Zambezi River, seeking redirection and reconnection with her troubled son. Katura Masaku, a smart but impulsive teenager in Botswana, sneaks across the border to Victoria Falls, naively confident she can rescue her wrongfully-arrested older brother. Her optimism is crushed by a corrupt police department that's willing to punish the innocent. And Jane's river trip ends violently with a hijacking that turns into an extended hostage situation. Zimbabwe's political chaos, not to mention the jungle itself, puts both Jane and Katura in danger. Will they succumb to their desperation, or find the courage to make it home? Rubbing Stones is an emotionally-charged debut novel about two families from opposite corners of the world, thrown together in a place where political and personal currents are more dangerous than the Zambezi that threatens to drown them. How far will they go to save the ones they love? Nancy Burkey is a practicing psychiatrist who closed her private practice in Northern California and now travels the country for several months every year providing temporary services to clinics and hospitals from coast to coast. She turned to fiction as the perfect escape from spending much of her time inside the minds of very real people, and she particularly likes the split between what people think and what they say out loud. 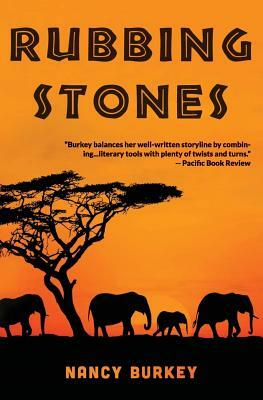 Rubbing Stones is her first novel, and it evolved from an adventurous trip she took to Africa with her sons. To find out more, or to sign up for her newsletter, visit her at www.nancyburkey.com.